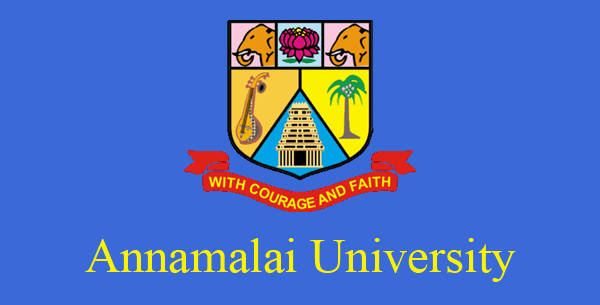 Annamalai University Online MBA Courses 2016: The Annamalai University is based in the state of Tamil Nadu and was founded by the visionary philanthropist, Dr. Rajah Sir Annamalai Chettiar of Chettinad, Kt, LL.D., D.Litt. The university came into existence in the year 1929 and is constantly striving to embark a mark of excellence in order to realise the dreams of the founder and Chancellor. The university was taken over by his son Dr. Rajah Sir Muthiah Chettiar of Chettinad, who became the Pro-Chancellor from 1948 to 1984. In the last eighty two years, the growth of the University has been steadfast with over forty nine Departments and more than 3240 members in the teaching staff. The University campus resides in the East of Chidambaram and includes campus, hostels, colleges and playgrounds. The National Assessment and Accredition Council has given an A Grade to the University. 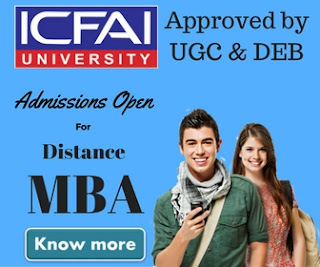 The University has a Directorate of Distance Education which offers MBA Programmes in different disciplines. The Programme is of two years and prepares Executives and Managers employed in the Private, Public Sector Undertakings, Banks or Educational Institutions and upskills their Business Management capabilities to handle responsibilities better and enrich the decision making process. The programs are recognized by University Grants Commission and All India Council for Technical Education, approved by the Ministry of Human Resource Department, Government of India. Masters in Business Administration in General Management is a two year online post graduate program which is offered by Annamalai University.The aim is to infuse an intensive knowledge in the students about a myriad of areas of Business Management which includes the socio-economic and legal environment. The course also aims to introduce concepts of entrepreneurship and International business. They thrive to inculcate additional knowledge in different areas of Management be it Human Resource, Productions, Finance or Marketing. The programs strive to develop basic business and communication skills and delve into how these theoretical concepts can be applied and used in the competitive world outside. The degree adds on to the skills of those who have 0-2 years of work experience in the relevant field. General Management degree is specifically designed for those who are unsure as to what specialization will suit their area of interest. In addition to a knowledge about general management, the program also offers 2 subjects as per the candidate's interest which can range from HR,Marketing Operations etc. This degree is beneficial for those candidates who are more of self employed professionals and also for the ones who are running family business and therefore, do not get time to pursue full time courses. After the completion of the course, a person with an MBA degree in General Management will be offered the position of a Supervisor,Junior Manager, Human Resource Manager, Marketing,Finance, Systems, Production Manager etc.depending on the area. This degree opens up a whole new world of opportunities in the retail, trading, manufacturing sectors. After the completion of the course. 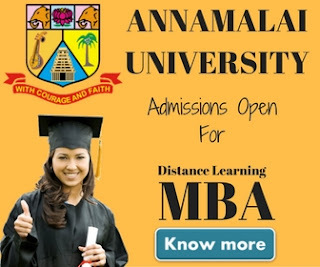 MBA in Business Administration in the field of Marketing Management is again a two year online post graduate program offered by Annamalai University. The motive of the degree is to inculcate a knowledge about a variety of the functions of marketing which includes pricing, promotion, production, advertising, budgeting and distribution. It also strives to introduce novelle concepts in the advertising, strategic management and marketing research field. An MBA degree in Marketing helps a student to delve into the world of marketing in the global arena and also to show examples of how these theoretical concepts can be applied in the competitive world for better output. This degree will mainly open up opportunities for a students in the sales, marketing and product promotion field. It will also provide job in the field of market research, distribution, customer service, product management etc. The job profile will range from Sales and Marketing Executive to Area Sales Manager, Department Head, Branch Manager etc. MBA in Financial Management from Annamalai University ensures a foundation of finance function in the minds of the students which range from Business Analysis, Asset and Fund Management, System and Control and Risk Management. A development of basic awareness regarding the production and material management with a focus on business research. The course curriculum will also familiarize a student with International finance and E-Business which are important pillars for the discipline and also a practical application of the theoretical concepts will be the concluding objective of the field. Managing the financial duties of a business enterprise is what this degree will prepare a student for.After the completion of the degree they will land up having jobs in the investment banking or corporate banking sector. They will be all set for relationship management, treasury management, portfolio management, asset management roles. The career graph may start from being a trainee or junior analyst and move on to Senior associate, assistant vice president, Chief Financial Officer etc. MBA in Human Resource Management will seek to build awareness regarding business management. It will strive to impart knowledge about various Human Resource functions which cover; hiring, appraisals, payroll, industrial relations and labour laws. These concepts familiarize the student with some of the new age practices in the HR field which includes organization development, E-business and change management. Functions like hiring, staffing, employee engagement, mapping talent, performance appraisals, culture building, reviewing the performance of the employees can be covered in the arena. The job profile is a lucrative one starting from HR executive or trainee to officer, General Manager, Vice President, HR director etc. MBA in E-Business Management focuses on development of basic and advanced knowledge in the E-commerce arena like security, apps, project management and web designing. It aims to familiarize a student with some of the important theoretical concepts of Information Technology like ERP, database management and MIS. be a technical analyst, business analyst,client coordinator or global marketing manager. MBA in International Business Management is designed to create an awareness about managing business in the international domains which includes trade operations and multi-cultural boundaries. The policies and practices applicable to Indian Businesses in the global aspect is also covered in the program. This degree imparts knowledge in the supply chain management, logistics, import-export finance area and the concepts of Economics, IT,E-commerce are explained in detail. Companies handling International projects or going global are generally looking for the candidates with an MBA degree in International Business Management. The job profile will entitle the candidates to be a Business Analyst, International Sales head, Client Relations Executive etc.